As a painter, sculptor and poet, Alan Fetterman has traveled extensively throughout the Americas and abroad, living and learning cultural values and Old World aesthetics. Travels aside, some of his greatest sources of inspiration have come from right outside his window, from simply existing day to day in a beautiful part of the world. As the winner of a Kay Scholarship, Fetterman was awarded $100,000 toward studies at the University of Pennsylvania, funds he utilized to earn a bachelor’s degree in philosophy. He also holds an associate’s degree in American studies from Bucks County Community College. Fetterman translates the knowledge he gained in these areas into his art. Fetterman has been featured in more than 30 solo exhibitions and has showcased various creations in more than 150 art galleries in places diverse as Carmel-by-the-Sea, Calif.; Curitiba, Brazil; and Vero Beach, Fla.
Additionally, his work can be found in some of the finest art collections in the Delaware Valley region, both private and public. Look for two large Fetterman original classics at Doylestown Hospital in the main lobby—“Doylestown at the Turn,” purchased more than 15 years ago, and “Waterways,” which is hung in bookend fashion highlighting juxtaposition and balance. At Bucks County Community College in Newtown, viewers will find a large sparkling night scene in the new Linksz Pavilion. The painting, “Spring Valley Eve,” captures the classic snow-covered evenings for which Bucks County has become famous. And there’s the grand-scale painting “The Land We Love” depicting a vast vista of hills and dales in upper Bucks County, which can be seen in the great room at the Heritage Conservancy in the Aldie Mansion. Adding to his list of public works is “Strength of Liberty,” a sculpture recently installed on the fourth floor of the new Bucks County Justice Center in Doylestown. The piece, which will stand in perpetuity, is a powerful yet sensitive melding of stainless steel, brass, glass and gold. Most recently, his paintings were purchased and hung in the Eisenhower House at Gettysburg College, where President Dwight D. Eisenhower wrote his memoirs. “Bucks County and the Pennsylvania/Delaware River Valley region remains the center of my being—a touchstone for a bright and balanced land; I simply love our homeland,” says Fetterman. “Creating from its many offerings is an insatiable exploration for me. … Yet living here for more than 50 years seems to have gone by in a blink of an eye, and painting it is always an honor. 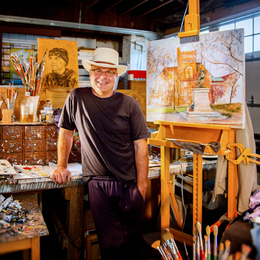 One recent collector of Fetterman’s art is Glenn A. DeBias, D.O., an innovative surgeon, community supporter and entrepreneur based in Doylestown. “As one who owns two Fetterman paintings, one very large scale and one smaller, I believe Alan’s artistic eye and hand captures the essence of nature’s beauty,” Dr. DeBias says. With his fresh, energetic brushwork and dynamic tones of color, Fetterman’s art delivers a powerful sense of both well-being and genuine goodness. “Each and every painting I’ve ever created is built on passion and a personal value,” Fetterman says. “Passion, in its core definition, is to be able to absorb the pain to reap what you want or to have fruitfulness of what you want. … It’s driving through the pain is what passion is. Being a viable artist—surviving and excelling as one—takes passion.